Spring is not the time to think about trimming trees. Your trees are just emerging from the winter. They need every bit of help they can to begin growing without receiving the additional shock of being trimmed. Wait until mid summer to begin trimming your trees. You may want to hire an arborist to trim them properly. In the spring you may have some damage branches that have fallen to the ground. Or some that may have been damaged due to the weight of snow. These tree limbs can be considered as candidates for trimming since they are likely going to die anyway. These are limbs that are cracked and or bent badly. In some cases they may even be touching the ground. These trim limbs can certainly be trimmed. The remainder should be trimmed in the summer as previously mentioned. There may be some large limbs that are hanging over the house or protruding into your neighbor’s yard which could pose a potential danger during a large storm. These limbs should be removed by a professional tree trimming service with the tools to safely and properly trim trees. They will come with a chipper machine which will reduce the tree limb to piles of chipped wood which can be used for mulch. A decision to cut down a tree or to perform a major trimming should not be taken lightly. Some real estate agents feel that trees, especially mature trees add value to the home’s value. Purchasers look for shade and cover from the sun and prefer larger trees even though they might be a danger to your home. Have your trees trimmed at regular intervals and trimmed in such a manner that over time the trees will be full and healthy while posing no danger to your home or anything else in the yard. Healthy trees also live longer and make a positive contribution to your home. If you are unsure about how to trim your trees, you may want to hire an arborist to evaluate your trees and make recommendations regarding what action should be taken. For example your trees branches may need thinning, or there may be weak branches that should be removed. Limbs that are within 10 feet of a building can be trimmed to avoid future conflict with the building. Large limbs that need support which you do not want to remove can be supported by cabling them together. In addition to providing shaded areas during the heat of summer which can be enjoyed outdoors by home owners, there are other advantages as well. Shade trees that provide shade to a home can reduce the cooling costs in the summer time. These same large trees can limit the impact of wind as well in the winter time and reduce the cost of heating in the winter time. If there is a lot of road noise nearby, these same trees can provide sound insulation from the noise and make it more peaceful than it might otherwise be. Removal of large trees can be expensive. 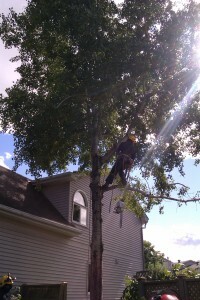 However if it is diseased or has received major damage, an arborist may recommend taking it down. Large trees can cost as much as $2000 to remove including the stump that can be ground down with a grinder. This leaves a nice clean job with almost no sign that the tree was ever there. We have two smaller trees removed on our own property by professionals. Instead of tree trimming, we just had them cut down. They stripped all of the branches and then cut the trunk down in 4 foot sections from the top. It was very interesting to see it done and these guys not only did a professional job, they cleaned everything up after words and did not damage anything around the tree at all. If I had actually trimmed these trees at the proper time, there would have been no need to remove them, but they got too big and could have damaged the house if a major storm had brought it down. One tree did come down and we were very lucky. It fell right between both houses and did no damage at all to either house or anything around it.